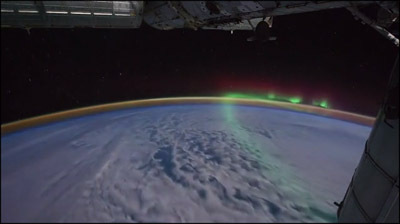 These incredible time lapse sequences are pieced together from thousands of photographs taken aboard the International Space Station by crew members and photographers of Expeditions 28 & 29 (August through October of 2011) at an altitude of approximately 217 miles above sea level. German tech wizard Michael König took the time to gather together all of the photos from the Image Science & Analysis Laboratory, NASA Johnson Space Center, and The Gateway to Astronaut Photography of Earth, put them in sequence, and then “refurbished, smoothed, retimed, denoised, deflickered, cut, etc.” all of the footage, taking care to avoid any kind of color adjustment or other visual manipulation, so as to let this beautiful, surreal footage speak entirely for itself. Watched this at Ardent the other day on the big screen, followed by a reprise of the Burning Man tilt shift video. Beautiful stuff. This real footage looks more amazing than any movie CG! Finally watched this. So awesome. What’s happening with the green aura at the edge of the atmosphere? It’s gorgeous.